VinylDecals.com Decals are shipped according to the information supplied by the customer. If a shipment is not delivered due to an error made by the customer submitting incorrect information, VinylDecals.com will reship the package with corrected address at the customer's expense. VinylDecals.com cannot be responsible for any shipment delays due to the shipping company's error or weather. VinylDecals.com is unable to bill shipping charges to a receiver's/third party account. If a package is returned to VinylDecals.com after 3 delivery attempts by the shipping company, the package will be resent at the customer's expense. All of our standard shipments are shipped through the United States Postal Service using First Class Mail. Priority mail is available for an additional charge. We have found the USPS to be unreliable in their delivery schedule and tracking system. 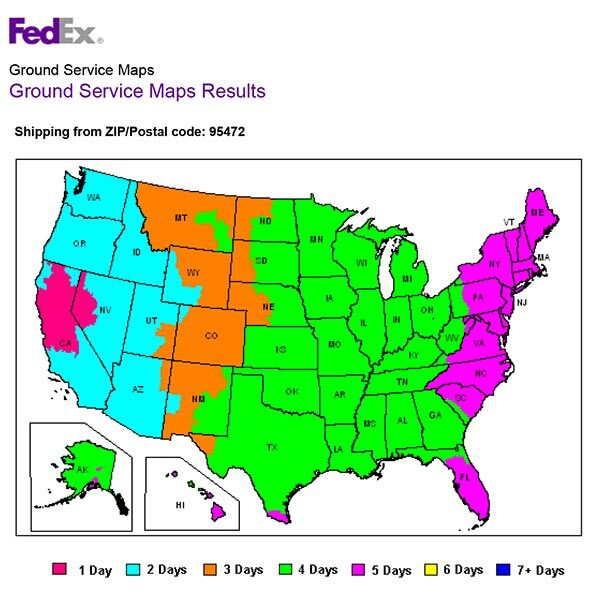 We strongly advise to use Fedex Ground for reliability. Shipping times DO NOT include Processing time. All of our decals are made to order. Standard processing time is 2-5 business days. Orders placed on holidays or weekends are processed the next business day. Orders are shipped from Petaluma, CA. All of our decals are made to order. If you need to cancel your order, you must email us ASAP with your order number. Cancellations are subject to a minimum 5% administration fee. The order is only cancelable if we have not started on production of your decal. Once production has started on your decal, the order cannot be canceled. If a proof has been created and you decide to cancel the order, a $20 setup fee will be applicable to your refund.